Siloing is a way of arranging a Web site's contents according to themes, which facilitates search engine optimization. Search engines catalog information logically by subject, which allows them to easily find and return the most relevant Web sites for any user's search query. The more organized your site contents are, the clearer your site's subject relevance becomes to search engines as well as to users. Similarly, a Web site's contents must be clearly categorized into themes in order for a search engine to know what it specifically contains. If it has no recognizable silo structure, it can only possibly relate to a general subject keyword and probably won't have high rankings even for that. Many Web sites contain a jumbled mix of subject matter. Trying to offer something for everyone, they lack focus. Others may select a main topic to focus on, but then they don't organize their content beyond that. Either approach can lead to poor search engine optimization because search engines cannot figure out what search queries the Web site is most relevant for. Trying to rank for everything leaves many sites ranking for nothing at all. For example, take a site that sells power tools. Without siloing, its pages might look like a mixture of disorganized topics. Search engines looking at that site would only be able to tell that it's about "power tools" -- a generic and highly competitive term. In order to rank for more specific search terms, it would need to organize its site contents into categories, or silos. 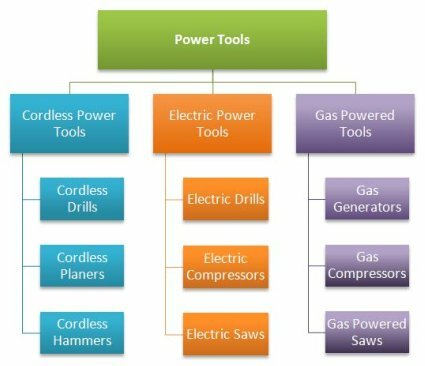 To decide what the categories should be, we would look at what the site contains and do some keyword research; based on this, we might pick the main categories "cordless power tools," "electric power tools" and "gas powered tools." 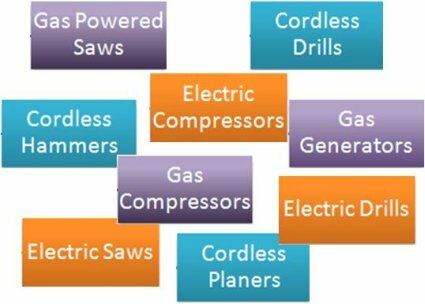 Each main category could then be broken down into its appropriate subcategories (drills, planers, compressors, etc. ), with landing pages arranged as shown below. Organizing the Web site in this way would clarify the site's subject relevance and lay the groundwork for high rankings for a large number of keywords. You can achieve clear subject relevance and the best SEO benefit by siloing your site contents through linking (virtual siloing). Adding physical siloing only strengthens the effect and offers some extra user benefits. Consider doing both for maximum effectiveness. Here's how. With virtual siloing, you arrange all of your internal links strategically. Rather than allowing each page to link willy-nilly to any other page on the Web site, prune links to show the connections between related pages within a silo and main landing pages. It could look like this: The home page links out to just the top-level landing pages of the site. These main landing pages (at the top of each silo) then link down to the subcategory landing pages in their silos. Each subcategory landing page links down to supporting pages within that subcategory. In each case, page links go straight down to lower pages in the silo structure, or straight up to the landing page(s) above in the same silo. 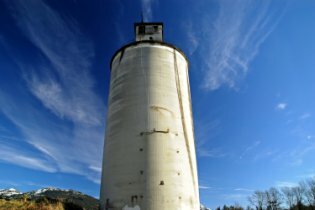 Pages within a particular silo can be freely linked between, but links should not cross over to pages in different silos. So in the power tools Web site example, we created silos for gas, electric and cordless power tools. 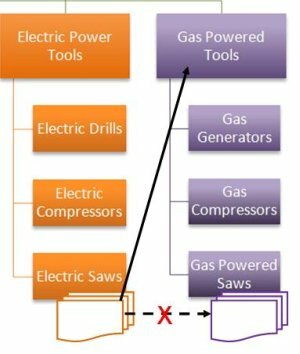 Silo landing pages would need to be optimized for each of the category terms, labeled "Cordless Power Tools," "Electric Power Tools" and "Gas Powered Tools" in the diagram. Those pages would link down to their respective subcategory pages (e.g., "Electric Saws"), and those pages would link to all the various supporting pages (e.g., product pages for the different models of electric saws). Now that the structure's set up, we can link freely within each silo, as shown below. Linking can be done from one electric saw product page to another (because they are all relevant for the keyword phrase "electric saws"), or from one subcategory's landing page to another (because they are all relevant for the keyword phrase "electric power tools"). Navigational menus as well as body text links need to conform to your virtual siloing strategy. You might think that because you have a clear organization within your global navigation, the search engines can easily understand what subjects your site is relevant for. However, in many cases, the categorization that the menus provide is lost when the spider indexes the page. To a search engine, your menu is just a long list of links. And if you have a very detailed menu structure that resides globally on every page, all of those links contribute to a diluted understanding of each page's subject relevance. You may wonder how then can you maintain the look and feel of the navigation and draw emphasis to the correct categories for users and for spiders? There are many ways this can be accomplished, but the best scenario is to link from the home page to just the top level silos, and from those secondary navigation elements you try to link just to the pages within that silo, etc. Just by the URL, users and search engines can tell that this page has a Makita product that's a hammer, of the cordless variety, and a power tool. It's easy to see that such a clear directory structure could help improve not only the subject relevance in a search engine's index, but also click-through rates on a search engine results page (SERP) since a searcher can easily see what the page contains. (This assumes that the on-page elements such as the Title, Meta tags, headings and body content all relate, as well.) As a side benefit, since external links often use just the URL as anchor text, your link value goes up by having keywords in the anchor text of incoming links. Without a clear directory structure, visitors can become easily lost as to the purpose and theme of the site. You don't want to overdo this and create unnecessarily long URL strings, however. Generally you should try to keep your directory structure to no more than four levels deep for large sites. Whatever method of siloing you choose to implement, step one is understanding what your Web site is really about. This is not as easy as it sounds. To rank for more than a single generic term, you have to selectively decide what subjects the site does and does not relate to. Rankings often are damaged in two major ways: either by including irrelevant content, or by having too little content for a subject. Don't just go by what you think the site should be relevant for. Do some homework using online SEO tools to find out what subjects and keywords your site currently ranks for, and which topics you have substantial content to support. (Our subscription-based SEOToolSet® provides a full suite, or start with free tools such as our Single Page Analyzer or SEODigger.com's SEMRush). Siloing can help you arrange your site's content skillfully, making the most of the information available on your Web site so that it clearly relates to category terms. However, siloing cannot make up for a lack of content. Once you know what you are ranked for, what your site is already relevant for, and what you want to be ranked for, do some analysis to determine why the top-ranked sites for those terms rank the way they do. True, a clearly siloed site may outrank a bigger but less organized site for a particular keyword phrase. But don't rely on that. For each keyword phrase you identify, you need to make a decision: is it worth the work required to rank for a subject you don't already rank for? To make this decision, you must consider whether your site is really about that theme, and whether adding enough content to be competitively "about" that subject would make your Web site become more or less relevant for its higher priority terms. You do not want to dilute your site's primary focus by adding extraneous silos. Figure out whether or not you should make the commitment to establishing any new theme and doing the work required to support it. When the answer is "yes," siloing your internal linking and site architecture will help you make the most of it. This is part 3 in our series on the SEO Hierarchy of Needs.